In this week’s issue project XT500 hits the road, buy a new bike for less, plus £3000 used motorbike heroes. 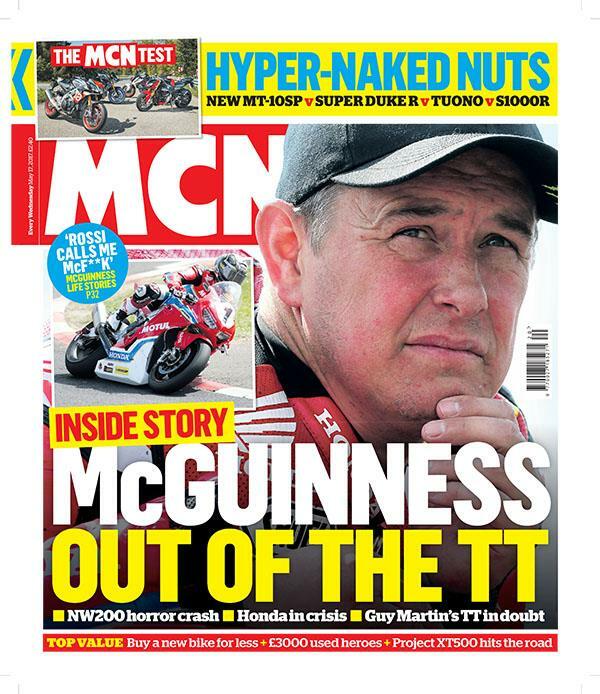 John McGuinness will miss out on this year's TT after a massive crash at North West. The 45-year-old legend crashed his 2017 Honda Racing Fireblade at Primrose corner on the coast road section of the 8.9 mile Northern Irish circuit. We take the supernaked class of 2017 to Germany's B500 on Europe's most extreme road. Dripping in Italian flair, and with attractive European cycle parts, can the reborn Speed Working Motors compete with the best? The R1200GS TE is BMW's deluxe range topper - so do the 2017 updates make the new TE Exclusive even better?